Neighborhoods in Detroit are in for some extreme, and much needed, renovations. In an effort to rehabilitate neighborhoods and get occupants into previously foreclosed properties, the city is auctioning off properties for as little as $1,000 starting next month. 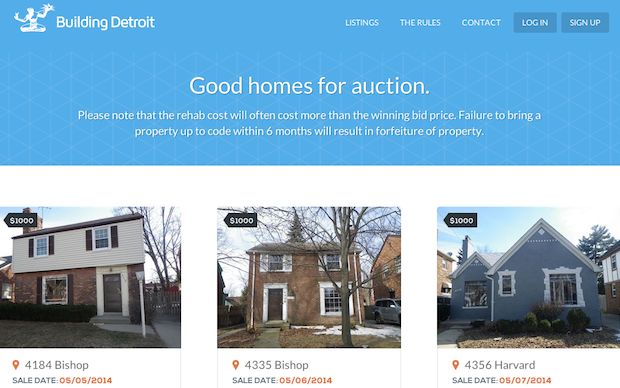 The city of Detroit launched BuidlingDetroit.org Monday to auction off 15 city-owned foreclosed homes in an attempt to fight blight and boost neighborhood home values, CNN Money reports. Beginning on May 5, one property will be auctioned to Michigan residents each day with a starting bid of $1,000. While the homes come at a bargain price, the city has instituted several caveats to the program and failure to meet the requirements will result in forfeiture of the property and money. Winning bidders, who can not have prior building code or blight violations or tax foreclosures, must come up with a 10% down payment within 72 hours of purchase. The new homeowners are required to close and make full payment within 60 days if the purchase price is below $20,000 or within 90 days if the price is more than $20,000. Additionally, any rehab to the home must begin within 30 days of taking possession of the property and must be submitted to the Detroit Land Bank Authority. Finally, the home must be occupied within six months of the purchase. The 15 homes getting ready to hit the auction block are only a small fraction of the 16,000 homes the city currently owns. Detroit neighborhoods were hit especially hard during the recent recession and housing crisis. The issues of foreclosure and subsequent blight neighborhoods was only further exasperated by the city’s struggle to get out of bankruptcy. The city will host open houses for the properties on April 27 for prospective buyers to see just what they’re getting into.